The truth about drug tests: Why drug users are passing, and non-users are failing. ""Ur-ine Trouble is going to blow the lid off drug testing in this country. After reading the book even the most devout proponents of drug testing will be forced to reexamine their position on its widespread use. You need to protect yourself from falsely being labeled a drug user by the inaccuracies of drug testing. Dr. Holtorf reveals how drug testing can be unfair, inaccurate, and racially biased." 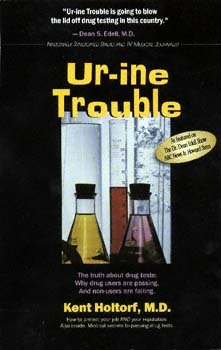 "Ur-ine Trouble is highly recommended reading for anyone required to submit to drug testing protocols." "Following a worker's compensation claim, I was drug tested and falsely labeled a marijuana user by a drug test due to use of an over the counter medication. The company then denied me my worker's compensation and unemployment benefits, but armed with a copy of Ur-ine Trouble, I was able to clear my name and reputation and get the benefits I deserve." "I lost my job due to a positive drug test caused by my bronchitis medication. But after providing a copy of Ur-ine Trouble to my attorney, she was able to get the company to admit that the test wrongly labeled me as a drug user, and they offered me my job back in this unjust and dismal situation, the book Ur-ine Trouble has been my ray of hope and sword of truth." "Using well-established studies and plain English, Dr. Holtorf clearly explains in Ur-ine Trouble how and why drug tests frequently produce unreliable results. Any person who faces drug testing for any reason should read this book from cover to cover and keep it handy in case the test turns out positive. This book is a marvelous antidote for our society's poinsonous practice of judging people by the chemistry of their urine."